Darko Trifunovic - Srebrenica Genocide Denier | Facts about Darko Trifunovic – self-proclaimed Serbian “terrorism expert” and Srebrenica genocide denier. After giving an interview to local nationalist Serb newspapers “Fokus” (January 3, 2008), Mr Darko Trifunovic failed – yet another time – to acknowledge Srebrenica genocide. Even worse, he was caught in a lie. In the interview, he called upon the North American Congress of Bosniaks to be sued and dismantled just because they criticized him. Pretty much everybody who criticizes gets labeled as “Islamic terrorist.” I won’t be surprised if he labels me as an “Islamic terrorist”, and I am of Christian faith. Mr Darko Trifunovic stated that “there are no statements where I deny genocide”, thus far denying his own denial! As a matter of the fact, Darko Trifunovic authored the 1st Srebrenica Report in which he claimed that only 100 Bosniaks Muslims died in Srebrenica. And that was his original “research” published under the auspices of Republika Srpska (Bosnian Serb Entity) government. A week ago, his E-mail response to Haris Djapic and Alen Jusufovic was exposed publicly at Srebrenica Genocide Blog, quote: “Are you sure you are Serb? Why do you care about Muslims? I wish Mladic killed them all.”Instead of offering his apologies to the victims and acknowledging Srebrenica genocide – he started equalization game (again). In this interview, Mr. Darko Trifunovic continued his manipulations by equalizing individual Serb victims of war crimes with the Genocide of Bosniak Muslim population in Srebrenica; then he went on to offer his (less than genuine) condolences first to the Serb and then to the Bosniak mothers by stating there were Serb and Bosniak victims in Srebrenica (attempting to diminish the significance of Srebrenica genocide in which Bosniaks were only victims; the Bosniak Muslims were victims of Srebrenica Genocide, not the Serbs.). Here is my advice for Mr Trifunovic! First of all Mr Darko Trifunovic – you cannot equalize individual war crimes with the monstrous crime of Genocide against Bosniak population of Srebrenica. Yes, there were individual Serb victims in the Bosnian war, and individual Croat victims, and many other individual victims, but none of them suffered Genocide. Only the Bosniak Muslim population of Srebrenica suffered Genocide at the hands of people you help defend at the International Criminal Tribunal by offering your manufactured terrorism related expertise (aka: propaganda).Second of all Mr Darko Trifunovic – your condolences mean nothing unless you acknowledge Srebrenica genocide of at least 8,000 Bosniaks publicly. Third of all Mr Darko Trifunovic – you should distance yourself from organization that openly deny Srebrenica genocide, such as the so called the “International Strategic Studies Association” (ISSA) which you are a member of – and many others. Forth of all Mr Darko Trifunovic, you should distance yourself from persons who openly deny Srebrenica genocide and fabricate propaganda, such as Milivoje Ivanisevic whose Srebrenica genocide denial and fabricated data about “3,500 Serb victims” has been condemned even by the Internatioinal Criminal Tribunal at the Hague. And finally, you should apologize to the relatives of 10,000 victims of Srebrenica genocide. DARKO TRIFUNOVIC: EXPERT ON NOTHING! Dr. Darko Trifunovic – self-proclaimed Serbian “terrorism expert”, falsifier of history, and Srebrenica genocide denier. PHOTO: Darko Trifunovic, disgraced Srebrenica genocide denier and falsifier of history, in this undated photo. Courtesy New York -based Bosnjaci.net Magazine. Srebrenica genocide denial is the most dangerous obstacle to the lasting peace in Bosnia-Herzegovina, and yet – it is a ‘weapon’ of choice for hate-mongerers. One of them is Darko Trifunovic who likes to think of himself as a “terrorism expert” or “specialist in terrorism and security studies” and is obsessed with only one specific kind of terrorism: “Islamic terrorism.” However, a closer look at his activities reveals that he is far from being expert on anything, and can most accurately be described as a fringe conspiracy theorist and disgraced denier and justifier of Genocide in Srebrenica – nothing more, nothing less. Tip: As an alternative to inaccurate, out-dated, and out-of-context taken analysis of Srebrenica victims’ numbers used by deniers, please read our Frequently Asked Questions, including Srebrenica Numbers (Quick Facts), and DNA Analysis from the ICMP. 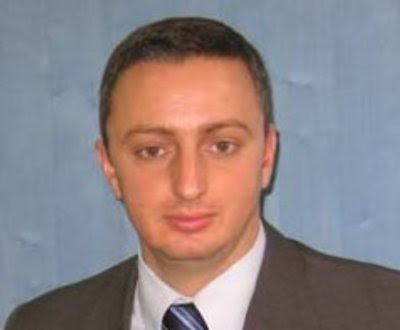 One of the speakers scheduled for the Panel Session “European Counterterrorism Strategies – Detection, Financing, Prosecution” is Dr. Darko Trifunovic from Belgrade. The Congress of North American Bosniaks (CNAB)… is sternly protesting to the organizers of the 11th Congress, requesting that Dr. Darko Trifunovic is excluded from the forthcoming Congress…. Dr. Trifunovic is the author of the scandalous “Report About Case Srebrenica Case (the first part)”… which he conveniently omitted from his Congress’ biography. On the page 34. of that report, Trifunovic concludes his ‘analysis’ of the number of Bosniak men and boys who disappeared during the events surrounding the Bosnian Serb take-over of the United Nations ‘safe area’ of Srebrenica with the ‘finding’ that Armed Forces of the Republic of Srpska (VRS) might have executed only less than 100 of “Muslim soldiers”. As a consequence, the remaining figure in the missing list would be the number of Muslims soldiers who were executed by Bosnian Serb forces for personal revenge or for simple ignorance of the international law. It would probably stand less than 100. As an alternative to Darko Trifunovic’s make-belief stories, one might read Srebrenica Genocide Questions and Answers: Responding to the Growing Assault on Truth and Memory, containing factual judgments from the International Criminal Tribunal at the Hague, the International Court of Justice, and other credible sources. Of course, Mr Trifunovic conveniently avoids acknowledging judicial facts issued by the highest international courts. It is mind-boggling that such an ‘expert’ in, and proponent of, the genocide denial and the psychological warfare of hate mongering could have been invited to speak to European policemen, interior and justice ministers, members of parliaments about the “European Counterterrorism Strategies”. He who himself is an ‘expert’ defender of Serbian terrorism of violating all applicable international conventions…. 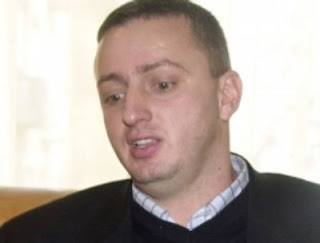 He is part of the notorious Belgrade state-security apparatus and locales, admitted even by the Serbian Government members to be behind Serbia’s active violation of the Convention on the Prevention and Punishment of the Crime of Genocide (Mladic in Belgrade etc.). With other readily available details about his other extremist activities and involvements, one has to ask: what is the real agenda here? 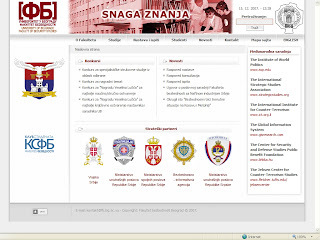 But, a closer look at Darko Trifunovic, as well as people and institutions he associate himself with, reveals even more disturbing picture.He works at the University of Belgrade (Faculty of Security Studies), and the official website of this Faculty features Srebrenica genocide denial links prominently displayed on its front page. For historical reasons, we have made a screenshot of their web site (see on the left) just in case they change their links in the meantime. Judging from the links promoted on their web site, we can only show our disgust at what these “academics” teach students in Serbia. It seems little has changed in Serbia in terms of extremist propaganda being promoted and thaught on Belgrade universities. No wonder Slobodan Milosevic’s propaganda is still active (see example of Serbs misusing photos of Srebrenica genocide mass graves by portraying them as mass graves of Serbs), which is the propaganda of the sickest dimensions. One of the featured links at the Mr Trifunovic’s “Faculty” is (not surprisingly) “The International Strategic Studies Association” – a global group of conspiracy theorists (also on record as Srebrenica genocide deniers and justifiers) who are trying to present themselves as highly skilled “terrorism experts” and “media analysts.” They even designated Darko Trifunovic as their Serbian representative. These kinds of obscure occupations, not requiring any education or diploma, are favorite choice for opinionists attempting to gain credibility, e.g. Srebrenica genocide deniers Edward S. Herman and David Peterson enjoy refering to themselves as “media analysts,” while another Srebrenica genocide denier – Milivoje Ivanisevic – liked to think of himself as a “researcher” and “statistician.” Even Holocaust denier David Irving enjoyed refering to himself as a “historian” (more on him ad Deborah Lipstadt’s blog). There you have it. Darko Trifunovic’s propaganda is not confined only to the walls of the Faculty of Begrade and Serbia’s government institutions. His manufactured stories about the “Islamic terrorism in Bosnia” and the Srebrenica genocide denial go well beyond the walls of this disgraced “Faculty”. He is also actively involved with the Serbian Unity Congress lecturing “Serbian Caucus Congressmen” about individual crimes committed by Croats and Bosniaks. Of course, Mr Trifunovic failed to mention that the Serb side was responsible for 85% of the crimes in 1992-95 Bosnian war, as well as the fact that only Serb side committed genocide. Mr Trifunovic conveniently left that fact out. We suggest a different approach – let him “blow the wind;” his credibility has already been shattered in pieces by his blatant Srebrenica genocide denial. He has done irreparable damage to himself and to the people he claims to represent.